To put finite possibilities of making your Valentines Day special, a special Cake, or even cupcakes and a Jar of cookies for me is such a special gesture that you can show to your other half and everyone around you. Julie's Bakeshop, your largest neighborhood bakeshop chain, has offered something for you this one of a kind season of love. Julie's Bakeshop heart Shape Cakes, and Cookies. 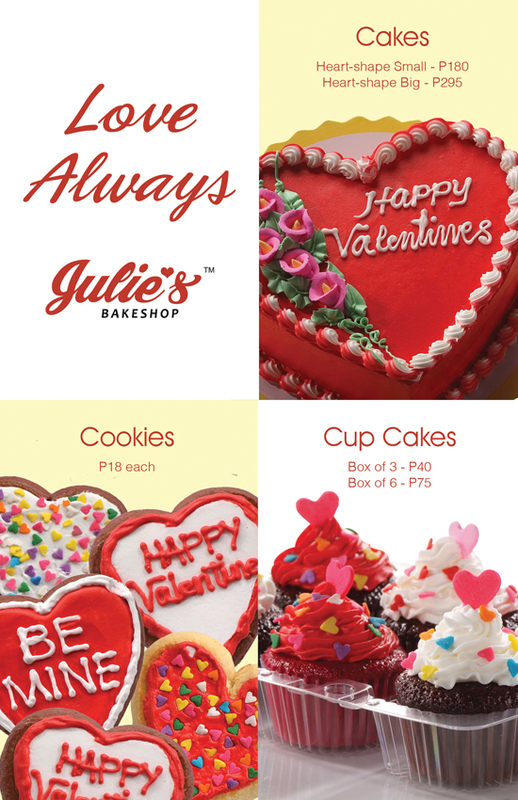 Date at your nearest Julie's Bakeshop now and show some Love! To know latest from Julie’s Bakeshop and its products, visit their website at www.juliesbakeshop.com.ph and like their Facebook Page at www.facebook.com/JuliesBakeshop. 0 comments: on "Julie's Bakeshop Valentines Treat to Customers, Cakes and Cookies"